So another Key game. The first game by R&D Games from a designer other than me! David Brain and I have been play testing together for a while. David introduced me to his game 'Book of Hours' at one of our sessions in 2007; however it was not until 2009 that I finally persuaded David to hand the game over, as it were, so we could start the R&D development process together. I've added David's own story of the game on the box bottom sides (see item 15 below), as I never like to waste any space. I hope you'll find this interesting. In many respects it’s a shame we couldn't have published the game earlier, when some of the games ideas would have been new to the market. I think you will find that the game fits into the Key series quite well. Like all the other Key games it is set in the medieval land of Keydom. There are plenty of choices and things you'll want to do. But Key Market is not a very forgiving game, you need to plan ahead, how to spend, when to sell. Like the other recent Key Games, the player interaction is indirect, there is no violence (unless it is introduced by the players themselves! ), there is more skill than luck and you will undoubtedly become more skillful at the game the more times you play. In complexity it is at the higher end of the scale, probably approaching the Reef Encounter level. Each game will be different. 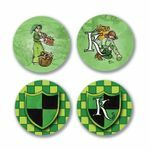 There are four double sided country boards to choose from and arrange and there are twelve guild tiles, of which a maximum of seven will come into play. The particular guilds and combinations available will have a big impact on the game. But unlike some other games, all players have the same opportunity to acquire the skills available, so timing and turn order is important. This list will give you a quick flavour of the game and an idea as to whether it’s a game you will enjoy. 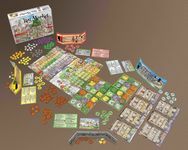 Key Market is being published as a limited edition game of 1,000 copies at Essen in October 2010. However all of the copies in the run have been pre-ordered prior to the show and I am now unable to take any further orders. Sorry. Copies can be obtained by post from Board and Bits, Boardgameguru, Funagain Games, Heron Games, Leisure Games, Newgamesorder, PlayMe and Shire Games, whilst stocks last. Here are the contents set out for your first game. On the box bottom they are all cross referenced to the game rules (to save space so I didn't have to include the image in the rules as well). If you look carefully you will see that the guilds in play are numbered 1 to 7. It is recommended you use these for your first game. There are twelve guild tiles in total. All components are in English and German. The story of the game is set in the lands of Keydom. Each player controls an extended family of ten workers. One worker becomes a player marker on the seasons board. In the three and for player game one worker becomes a player marker on the favour track. One of the workers is marked with a 'K'. This worker is has special abilities if the 'Guild of Key workers' tile is in play. Over the course of two years, players will organise their workers in an attempt to turn their initial scanty resources into a thriving economic system. In Key Market resources are produced from the fields on the country boards according to the shape of the field and the season. The resources are represented by 90 resource markers of which there are 5 different types. 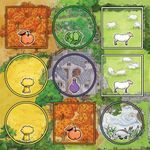 There are 3 types of crops, each with their own veggie-meeple: fruit (orange coloured apples! 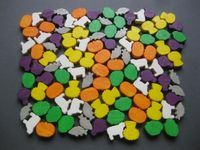 ), vegetables (green coloured cabbages) and wheat (yellow coloured wheat sheaves) plus 2 types of livestock with their own ani-meeples: fish (grey) and sheep (white). In addition there are 18 wooden luxury markers (arti-meeples?) in purple and represented by a bottle icon. Luxuries are produced in the village in the centre of each country board. The playing area in Key Market is made up of several separate country boards, equal in number to the number of players. Each country board is double sided. Each side of the large country boards is unique and is divided into 9 fields arranged three-by-three (see picture). The centre field contains a village. Each field contains either a circle or square shape and a resource or luxury icon, which together will indicate the field’s productivity in any given season. A group of orthogonally (horizontal or vertical) adjacent fields generating the same type of resource, but irrespective of shape, is known as an area and may extend across multiple country boards. However only the single field occupied by a worker will determine production. The size of the area does not affect production. Only one worker may occupy a field or an area at any one time. Two of a player’s own workers may not be directly adjacent - orthogonally or diagonally (see illustration below). Workers may never be placed directly into the village. If a player has a craftsman or guild master in the Guild of Key Workers, then some of these placement restrictions will no longer apply to the Key worker. 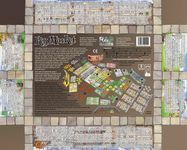 In the two player game there is an additional small country board which is divided into 3 fields. On the reverse of this board is the favour track board (pictured) which is used in the three to four player game only for settling tie-breaks. This is the system first devised by Corné van Moorsel and used in his 2002 Cwali game O Zoo le Mio. Special thanks to Corné for his permission to re-use this clever mechanism. The season board accommodates the player markers, which indicate the season and phase that each player has reached, and the season markers, which indicate the production levels for the season. Each field is one of two different shapes: a square shape indicates that a field usually produces 2 resources per season, whilst a circle shape indicates that a field usually produces 1 resource per season. This production is known as the field’s ‘base’ production, which may be modified by the workers in the guilds. A worker produces resources according to the type and shape of the field they are occupying. Both shapes of the same resource type may be in a single area, but that doesn’t affect production. The four seasons are represented in order on the season board, starting on the left with the winter season. Each season is broken down into three columns representing the three phases of each season: farming, market day and end of season, which the player markers advance along. The snowflake symbol indicates the winter season and also appears on the guild tiles which give rise to production in winter where there would not otherwise be any. Winter at the beginning of year two can be a tough period to get through in this game! On the reverse of the seasons board (and the market board) is the score track board which is used for scoring at the end of the game. The market board shows the current price and availability of each resource and luxury. Buying and selling resources or luxuries in the market will cause their price to change. The current price is the highest visible number shown on the row for that resource or luxury. Each time a resource or luxury is sold to the market a resource or luxury will be added to the board in the next available space, thus lowering the price by one. Each time resources or luxuries are bought they are removed from the board, thus increasing the price by one or two. There are 12 guild tiles. (Each tile is double sided. One side is in English and one side is in German.) 5 to 7 tiles are used in a game depending on the number of players. Having a worker as a member of a guild provides one of a variety of skills, such as improved resource production, easier worker recruitment or movement and enhanced trading abilities. A guild has three levels: apprentice, craftsman and master, each of which gives rise to an additional skill. A worker enters as an apprentice (at a cost of 2 resources) and may be promoted to craftsman (for 3 additional resources) and perhaps ultimately to the position of guild master (for a further 4 resources). A player must always use different resource or luxury markers when sponsoring or promoting a worker. For example, the cost of sponsoring an apprentice is 2 resources, so a player could not use two green resource markers to pay this cost. However, one luxury may always be used to replace any 2 resources. Two luxuries may not be used as the resources and luxuries used would not then all be different! Each player starts the game with a farm house tile. These must be paid for with resources, which are placed into the market to affect the opening market prices of the resources. A first opportunity to unsettle your opponents, as you will have an idea already of which resources they have started to collect! These farm houses can be upgraded during the game to a manor houses, which are shown on the reverse side of the farm house tiles. The possession of a manor house allows players to sell larger batches into the market and can also accommodate retired workers. The farming phase which is played on turn order. The market phase where each player takes one action at a time until they have taken all of the actions that they are able and wish to make. The end of season phase, which affects all players and the game boards. This image is of two of the four player screens. The patterned borders match the backs of the worker counters (see below). So players have a choice of using the coloured worker images or the coloured and patterned heraldic images, which should be of help to the colour blind. And of course you will get the rule books. 16 pages in English and 16 in German. Courtesy of David (see below) you also get an index - but only in English as there was no space left in the German rulebook. The black numbered references in the index refer to the box bottom, which also includes a brief summary of the game and the designer notes. Key Market advert with Essen stand details.